Esri’s Shannon McElvaney getting into the nuances of data. But open data is not always available, sometimes for security reasons – for example, to protect endangered species or a targeted minority in a civil conflict – and sometimes because the sale of data itself is the funding mechanism for the generation of more data. Explaining how to overcome this barrier, Kirstin Miller, Executive Director of Ecocity Builders, describes the work of her organization and their use of both proprietary and open data. It is essential to find the right use for each kind. Kirstin’s words hint at the importance of looking beyond open data, which sometimes has good reasons to be obscured, stressing the need for an even more active form of sharing. Institutional collaboration can overcome issues of private property and security, and above all, it can foster a culture of cooperation among public, private, and civil society organizations, perhaps the first step to ensure the progress of the open data revolution and its ability to create change. Ecocity Builders ED Kirstin Miller highlighting the importance of cooperation in the jungle of data. 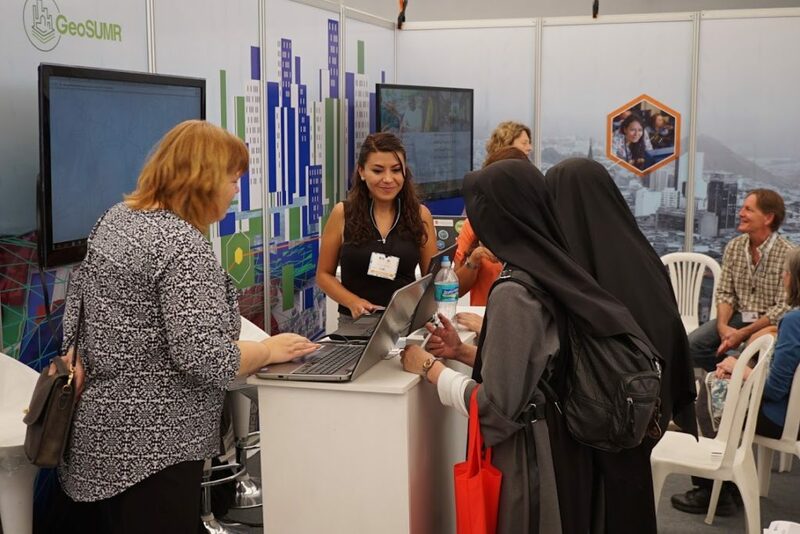 Buzzing with data at Booth 59. Photo Joon Nam. Using Esri’s GIS mapping tools, Carlos shows the audience the visual story of the Zika virus, from its origins in Uganda in 1947 to its spread through Africa, Southeast Asia, and Latin America. The visuals show degrees of incidence, following the trends for all the affected regions and making predictions for the most vulnerable zones. The spread of a virus like Zika respects no political borders, and this recognition should result in a paradigm shift regarding the way we address global health emergencies. That is, in terms of geography and environment, not politics. Colombia is a country with abundant water resources but with poor water distribution. Despite having a population of over 40 million people, there are only three cities where potable water is safe for human consumption. Carmelle describes the government’s new draconian policies to tax water pollution and increase sewage water treatment and shows us a map of the country using Esri’s Climate Wizard GIS tool. 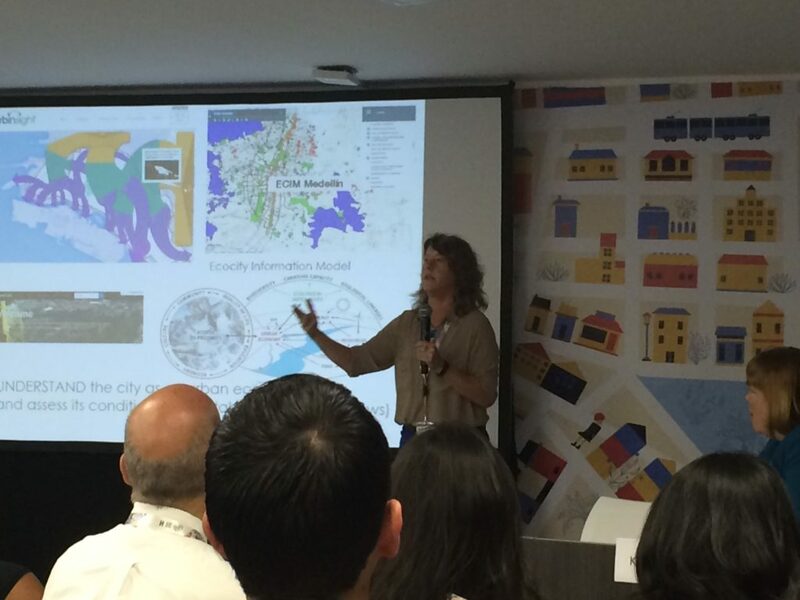 “By 2080, precipitation is expected to fall by 20% in Colombia,” she explains while pointing at the map, “So how do we plan for the future?” Esri Colombia, Colombia SDI, GeoSUR, and UNEPLive have partnered with the country’s autonomous regional development corporations to create an integrated water resource management system. The project began by creating a databank on pollution and polluters and the next stage involves mapping out Colombia’s water resources (watersheds, basins, catchments, elevation) and water infrastructure. Next comes the creation of a national water portal, an integrated platform for NGOs, public institutions, and citizens to understand the country’s water resources and to manage them soundly. Alejandro begins his presentation by asking the audience about the Paris Climate Accord, “So what happened to the Paris climate talks, and where have the climate change mitigation agreements taken us?” One key aspect about the 2015 Paris Climate talks, Alejandro notes, was the discussion on sub-national agents of change – grassroots organizations with the power to complement the work of governments and to push the discussion on reducing carbon emissions into the public agenda. La Ciudad Verde Collective has been one of those organizations since its creation in 2011 in Medellin, Colombia, focusing on raising awareness on the importance of climate change mitigation through initiatives involving strategic urbanism (like placing mask over the faces of a plaza’s sculptures during the worst “bad air” day in Medellin’s history, or creating pedestrian-only areas), lecture series and forums, and incidence in public policy through awareness-raising campaigns and discussions on issues related to food and agriculture, forest conservation, energy generation, and education. 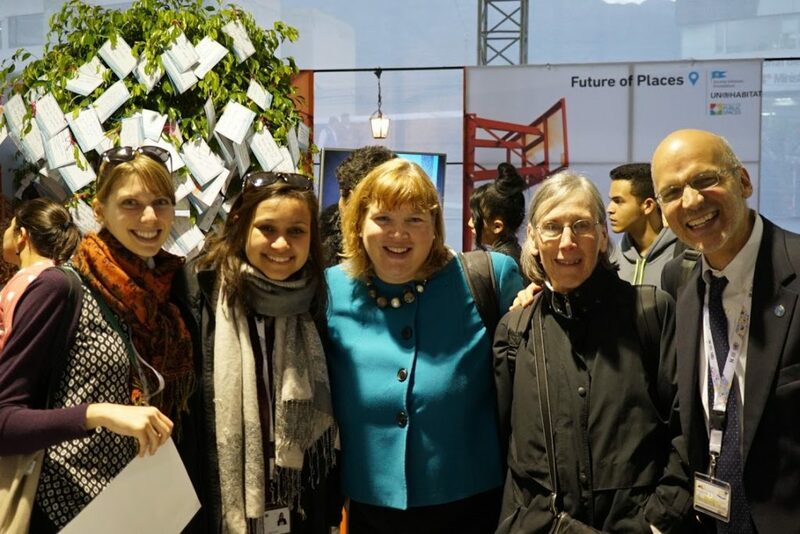 In addition, the collective has worked on creating eco-zones and low-carbon neighborhoods. 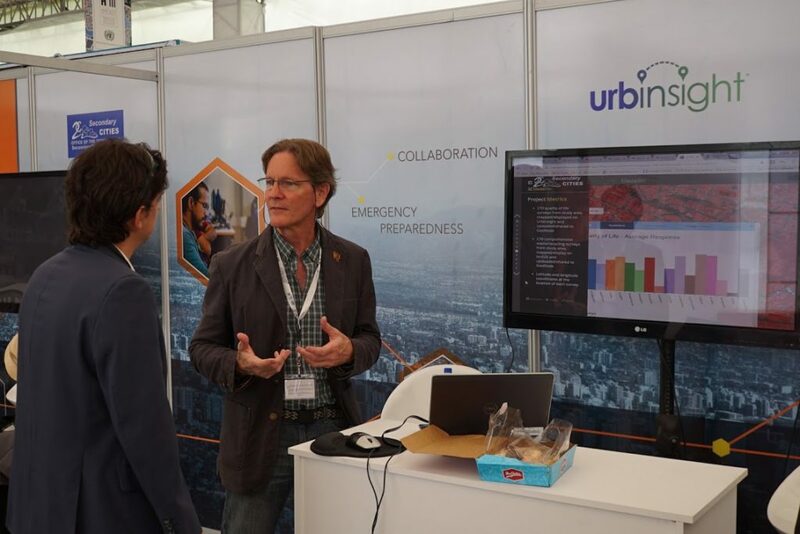 With support from partners like EAFIT and Ecocity Builders, La Ciudad Verde and Low Carbon Cities are collecting data and consolidating large datasets to help policymakers and citizens make better decisions to reduce their carbon emissions at the household, neighborhood, city, and national levels. Ending on a data high with Team Esri, GeoSUMR & AAG. Photo Joon Nam.